This stunning diamond solitaire ring is set on a delicately crafted, twisting palladium ring, with a 950 hallmark indicating its 95% purity. This ring features diamonds with a total weight of 1/3 carat. The Forever Diamond is exclusive to H Samuel, with diamonds that are renowned for their unique flower cut made up of 73 facets for exceptional sparkle. 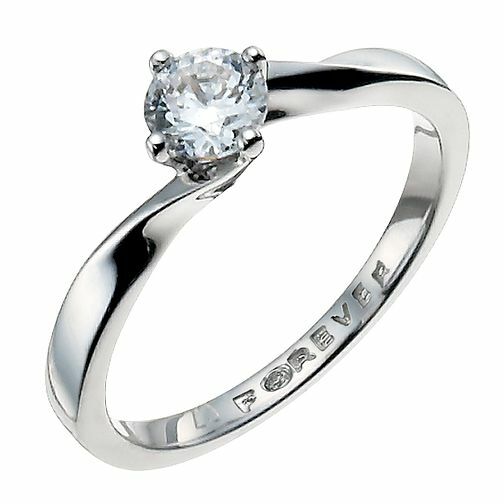 Palladium 1/3 Carat Forever Diamond Ring is rated 5.0 out of 5 by 6. Rated 5 out of 5 by Anonymous from Perfect. Just Perfect. My Partner chose this as my pre-engagement ring. I love it, i love the way it sparkles in every light. I get compliments on it all the time and im so happy that this ring shows my personality so well. Rated 5 out of 5 by Anonymous from Beautiful ring ?? Couldn't fault h Samuel at all my original ring was damaged and they couldn't replace the same ring. Claimed of the insurance which was from h Samuel and replaced with this ring. Such a beautiful ring would recommend anyone thinking of getting this ring to go view in store it's stunning!!! So happy.